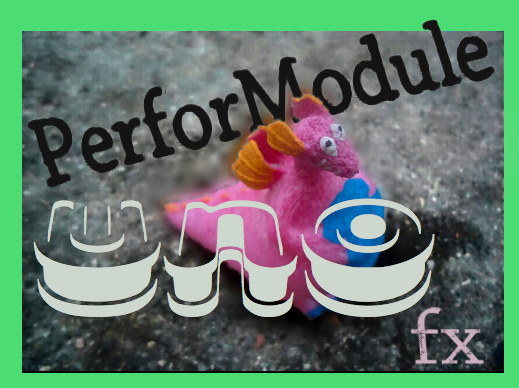 New PerforModule one-knobbies! GLi+tChH c-C-r>.’|)razZy_y ! These are relatively simple rhythmically-based one-knob effects, designed primarily for live performance, each based on a built-in ableton effect or two. Individually, they are very simple and easy to understand. They are optimized to be grouped into your own more complex multi-effects to map to midi controllers, with each knob having one specific function. Scrutch: Scratch / stretch the audio like a vinyl record — up or down. Breepify: Basic random beat repeat glitch device. Broopify: Pitch-drooping beat repeat glitch device. ChopEcho: Cuts out signal and adds looping echo. Flutter: Rhythmic chopping device with slow smooth sweeps or staccato fast flutters. Pong Repeater: Beat repeater using the ping pong delay effect. TripChop: A chopper layered with modulating rhythmic delay. Verb Repeater: Wooshy beat repeater using the reverb effect. Chopify: Simple rhythmic chopping device. Addendum: I’d like to thank the Ableton company and “Ableton Guru” AfroDJMac both for being awesome.